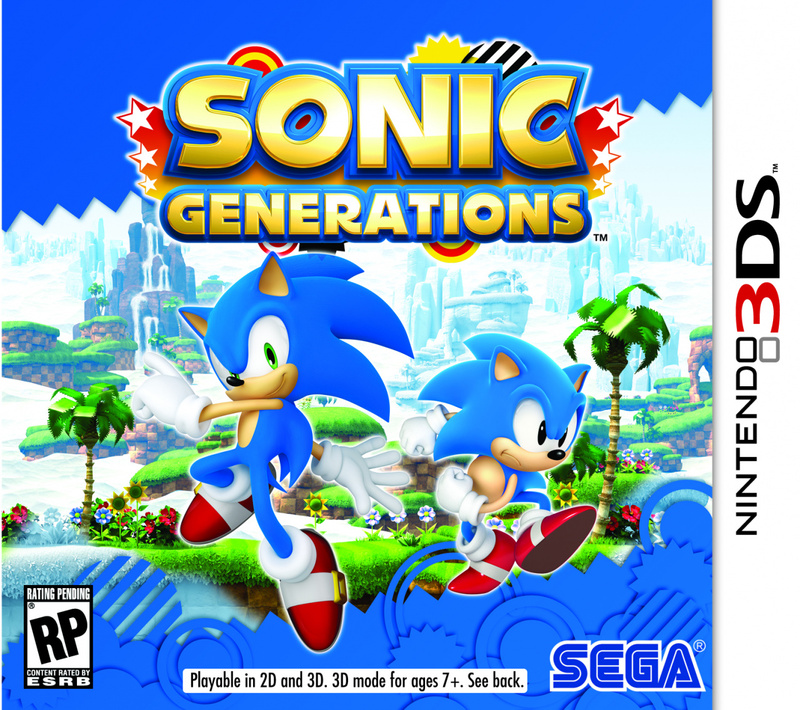 June was Sonic's 20th anniversary, and later this year Sega celebrates with Sonic Generations, a project that aims to combine the hedgehog's best and, admittedly, worst moments. 3DS owners get a very different version to PS3 and 360 fans, both for better and worse. 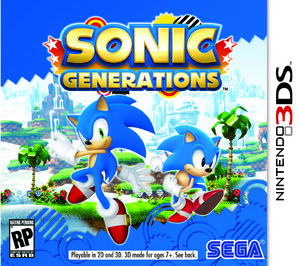 Sonic Generations on 3DS joins traditional 16-bit style platforming with more modern Sonic Colours gameplay, with a level from both styles on offer for us to play. The 16-bit Green Hill Zone looks pretty, though less visually packed than its HD console brethren, but in this version the frame rate leaves a lot to be desired: at its best the game managed 30 frames per second, but this noticeably dropped when Sonic took damage or entered crowded areas. Turning the 3D effect off helped the frame rate, but on the whole this is not quite the smooth visual presentation you'd expect. The game doesn't handle quite as you want either. Fans jumped on Sonic the Hedgehog 4: Episode I for its unfaithful physics, and in its current incarnation Sonic Generations is similarly messy: often Sonic jumped too far or came to a stop too quickly, and overall the running felt slippery. Surprisingly the Modern Sonic stages played better, with level design that'll be familiar to anyone who's picked up a portable Sonic game since 2006: lots of boost pads and grind rails, with an impressive-looking set piece where a giant totem pole threatens to flatten the heroic hedgehog. Those who can't get along with the DS Sonic games' boost system will find little to enjoy here, but it at least feels faithful to its source material, hardly surprising considering it's developed by frequent handheld Sonic overseers Dimps. 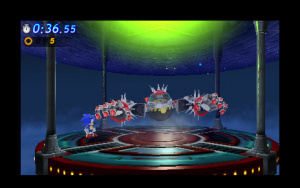 The third and final level on offer was against the Big Arm boss from Sonic the Hedgehog 3's Launch Base Zone, played through as Classic Sonic. The attack patterns are slightly different, and the stage and boss certainly look good in 3D, but it played slower than we remember and posed little challenge, though of course this is just a short demonstration. We're big Sonic fans here and have high expectations for Sonic's big 20th anniversary game: if SEGA is to acknowledge the hedgehog's history, it has to replicate or improve on the classic mechanics, but there's much work to be done here. Sonic feels less in your control in the 16-bit style levels than the boost-heavy, homing attack-packed Modern Sonic stages, which is not something we expected to say. Add in the choppy frame rate and slippery physics and we must admit our first impressions are not favourable. With only a few months until launch SEGA has a lot of ground to cover to bring the hedgehog up to speed. Definitely not an old friend. The fact that this game isn't all too great is honestly not surprising in the slightest. Well that's dissapointing. You'd think after the backlash of Sonic 4 they'd figure out how to do the physics right. It's games like this that make me consider giving that hedgehog I hate a second chance... until I start reading reviews. I realize these are just early impressions, but... so far it looks like this will be another missed opportunity for Sonic to woo over a new fan. So long as the console version is good, I'm happy. I dont see everyone problems with Sonic 4 is played great for me and who care about physics when the game plays nicely. I think everyone gaming now-a-days are getting to nitpicking with this and that. they do still have a couple mouths till release. i think they'll iron these problem out by then. This game just keeps sounding more and more disappointing. First, they announce that the modern stages aren't the 3D ones in the home console versions and now there is the awful framerate too. Looks like SEGA has got a lot of work on their hands if they want Sonic Generations 3DS to be even remotely better than Sonic Rush. 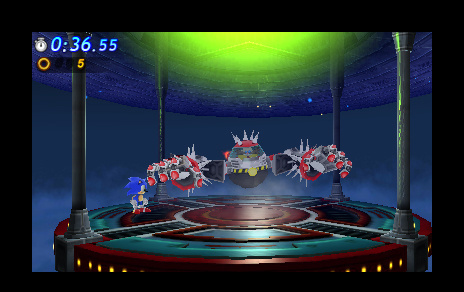 The HD versions are amazing though...and the new Chemical Plant screenshots enforce this. Sega poured all their development for E3 into the console versions. It's pretty obvious little work was put in the the 3DS E3 demo. 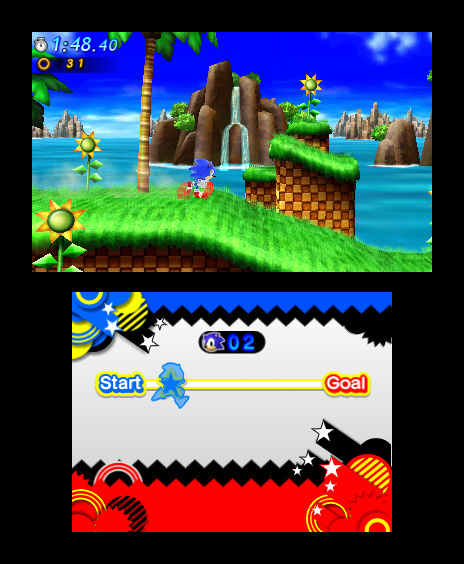 The classic version of Green Hill Zone is a direct rip of the layout from Sonic 1. At one point in Sonic 1 you fly off a ramp and into a group of rings in the sky. If you wanted to get all of them you'd have to hit a near by badnik for more air time. In the E3 demo, Sonic uncurls at this section, making him unable to hit the badnik. That was really disappointing to see. Hopefully the 3DS version will get a lot more attention, but at this point, it'll probably just be a cash in. That's a shame. Hopefully the console version will be much better as that's the version I want. its funny that they can become less smooth than the old genesis one. lets hope they will read this article and improve upon this. I enjoyed the PS3 demo of Green Hill Zone so as long as that stays good I am happy as a clam. The 360 demo for the classic green hill was fantastic. No physics problems, no control issues, it was great. wait the console Sonic looks better than the handheld one? It's like the 90s all over again! I really want a Sonic game on my 3DS, so I hope Sega improves it and we get a good one. Kind of a disappointment to hear this, but hey, we have plenty of other games that are looking great coming our way. I'm with Ryno on this one. I was pleased with the 360 version's demo, and if it's like that it should be fine, even with framerate issues. Oh c'mon SEGA. Is Sonic Colors going to be the only fantastic Sonic game to come to a Nintendo console post-Adventure 2 Battle? If so, Sonic is (once again) dead to me. looks exactly the same as the console games And of course it won't be AS good as the ps3 and 360 versions, it's a PORTABLE It';; be like Super Street Fighter 4 on 3DS. This is still on my must have list. @hydeks That comparison doesn't hold up since the "Modern Sonic" portion of this game is more akin to Sonic Rush as opposed to on consoles Sonic Colors. Plus the level designs are different anyway. It's not a port, it's more of a companion. Personally, I loved the PS3 demo so, unless they mess it up, I'll definitly buy it but I'll have to read quite a few reviews before I buy the 3ds version now after what I've read here. I also really liked the HD demos but this felt like a totally different game. Lots still to do here, I fear. @28 there's a DS version?? Ahhh, Sonic, oh how I hate you. BUT The PS3/360 version of Generations looks abosolutely amazing I've gotta admit. Woah, sounds pretty bad...good thing I'm only really interested in the HD versions. That's depressing...but I don't take anyone's word on a Sonic game anymore. I give them all a shot at some point. Ive not been impressed by this since I saw the E3 gameplay. I was excited for the 3DS Version at first but my expectations have dropped considerably. I really really hope that Dimps does put the extra effort in to get this game up to scratch. And theres even rumours that this version has been delayed till next year and if thats the case im all for it. If it gives them more time to get it right ill be fine. The console editions on the other hand are looking and (Based on the recent demo) playing fantastic. I cant wait for the console version. This one though I can wait for. I will get it no matter what form it comes in but I really do hope they listen to the feedback. Does Sonic stop midair when you let go of the D-pad? Sonic Colors (Wii) is basically a 3D version of Sonic Rush. And the DS version is basically Sonic Rush 3. Speaking of Sonic Rush, how can that series play so smoothly on the DS, yet Generations plays poorly on the more powerful 3DS? It is because the game uses polygons instead of sprites? Sega making a Sonic game with high hopes and ultimately having issues in the end? Oh well, at least the HD versions should be fine. I never liked the Sonic series. So when is Nintendo gonna make Mario Generations? Will its a handheld version of the game what do you expect? Oh wow, I hope, & pray Sega fixes these issues, b/c if I get a 3DS, this game I will get. Fix it, Sega! I didn't have a problem with the physics in Sonic 4 either. I haven't played much of the original trilogy though. And this game has to be compared to it. So sloppy physics are a no go. And i didn't think the Sonic Rush games were bad either. My hopes for this game are not very high anymore but i like being surprised by positive reviews. I still have no idea why we aren't getting a console version, instead of this dumbed-down port. I had issues with the 360 demo. It was hard to keep focused on the action, like there was too much going on on the screen at once or that they'd added a slight motion blur that makes it harder to look at than the old Mega Drive games. It's a problem I keep seeing in these new 2.5D platformers. Thing is, with a sprite you knew where you stood (literally) but when they try to put 3D graphics on a 2D plane, you lose sense of exactly where your character is standing. Then when you add a really lively 3D background it can make keeping track of your motions even harder. Anyone that's played enough old school platformers will know what I'm talking about. They had basic graphics, but that made them easier to play. The handheld version might get round this, but the framerate sounds like a killer. Too bad. I was hoping to pick this up along with a copy of the PS3 version. There's still time for Sega to get this right but I don't think they will. Looks like this version will end up as a rental at best. The Sonic 4 team is on this one too. Ouch! Not looking to good right now then! I'll wait for the review and see what I think.